Linas Kleiza in the Lithuania ā€“ Argentina match. Robertas Javtokas in the Lithuania ā€“ USA match. The 2010 FIBA World Championship was held in Turkey from August 28 to September 12, 2010. In the Preliminary Round, Lithuania won all of its five matches within its own group (Group D), including a win against Spain, the current World and European champions. Among the 24 countries playing in the preliminary round only two other countries had won all their five matches at that point - USA (in Group B) and Turkey (in Group C). Lithuania then won against China (78:67) on September 7 in the Round of 16 and went on to the Quarter-finals to crushingly defeat Argentina (104:85) on September 9, in a match which was Lithuaniaā€™s finest during this championship. 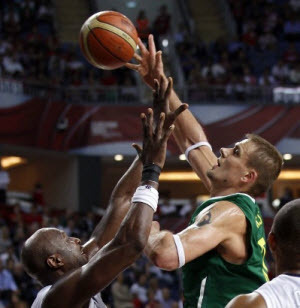 Lithuania unfortunately lost to USA (74:89) in the first of the two Semi-finals matches on Saturday, September 11. In the other Semi-final match, Turkey beat Serbia by 1 point. In the Final on September 12 the USA team defeated Turkey (81:64) and took the Gold, while Lithuania won the Bronze by defeating Serbia (99:88) in the third place match. The loss to the USA thus was Lithuaniaā€™s only defeat in the whole championship. In earlier international basketball competitions Lithuania has won the Gold in European championships and the Bronze in the Olympics. The 2011 European Basketball Championship will be held in Lithuania in September 2011.